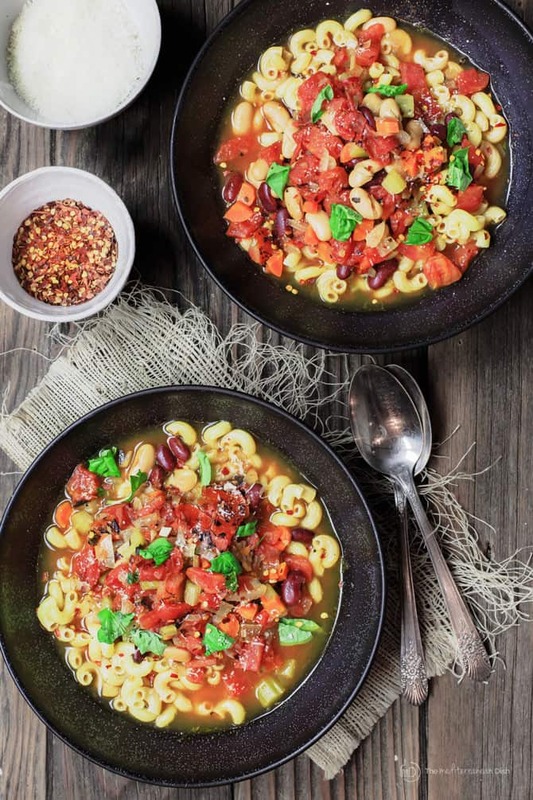 This vegetarian (vegan) Pasta Fagioli Recipe is a super simple, hearty, rustic Italian bowl of comfort. One pot, and a few pantry staples is all it takes! Pasta Fagioli, or Pasta e Fagioli, is a simple, humble-man’s “pasta and beans” dish from Italy. 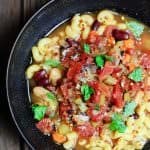 Because Pasta Fagioli is a very popular soup meant to use up whatever ingredients you have on hand–beans being a main ingredient– there are more variations of it than one can count. Some parts of Italy serve it with tomatoes, others keep it “white.” Some add sausage or meat, and others stick to a vegetarian (or vegan) version as in today’s Pasta Fagioli recipe. Where the draw lies in this vegetarian Pasta Fagioli recipe is in its simplicity. Every-day ingredients, cooked in one large pot. Plus, it serves a hungry crowd on a budget! Canned fire roasted tomatoes add a hearty, rustic flavor, eliminating the need for too many spices. Here, I only use dried oregano and one bay leaf, otherwise. As you’ll see in the recipe notes, I like to cook the pasta separately, then I add it to the serving bowls with the hot soup on top. Why? 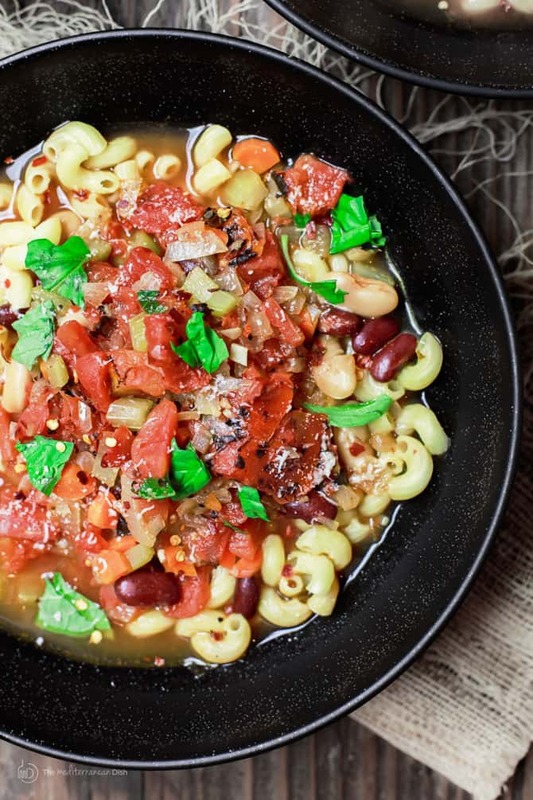 This Pasta Fagioli recipe provides 6 good-size servings, which means leftovers are inevitable. When the pasta sits in the soup for the next day, it tends to get too soft, and you end up with a fairly thick Pasta Fagioli. In a large boiling pot of water, cook the pasta according to package instructions. Drain well, and set aside. In a large dutch oven or cast iron pot, heat 2 tbsp olive oil. Saute the onions, celery and carrots on medium-high heat for 4 minutes or so until the vegetables begin to break down. Add the chopped garlic, bay leaf, and dried oregano. Cook for another 2 minutes, stirring occasionally. Now, add the roasted diced tomatoes, vegetable broth, cannellini beans, and kidney beans. Season with salt and pepper to taste. Bring to a boil, then reduce the heat to simmer. Cover the pot with a lid but leave a small opening. Simmer for 10-15 minutes. Bring to a medium-high heat, stir in the pasta until warmed through. Stir in the fresh basil, and remove from heat. Transfer to serving bowls and top with crushed red pepper (optional) and grated Parmesan cheese. Add your favorite crusty Italian bread. Enjoy! Alternative to step #4: Sometimes, especially when serving a small number of people, I prefer to add the cooked pasta in the serving bowls, topping it with the soup. That way, I can save the leftovers, pasta and soup, separately. Otherwise, the soup may get too thick overnight. If you want to do this, you can warm the pasta up by running boiling hot water over it. Drain, and then place the pasta in the serving bowls, then ladle the soup on top. I made this today exactly as printed with the only change being, I used a pouch of oven roasted yellow tomatoes in olive oil with garlic and oregano that I bought at a high end store. Never knew what to do with them, so I thought I might as well use them in here. It did create a different color, but still very tasty. I drained the oil offnthe tomatoes. I did as you suggested and added pasta as we ate it. That way I can freeze 1/2 Of it to have at a late date. I served it with salmon and Italian bread. Very delicious. Fern, thank you so much for sharing! I’ve commented to you previously about some of your wonderful recipes but this one is my favorite. I don’ strictly follow it (I’m not to strict about Emeril Lagasses’ recipes either}. The only thing I change, however, is that I add chicken spicy Italian sausage. I have a vegetarian daughter but she doesn’t seem to like anything without starch and sugar. Everyone else LOVES your recipes at least those that I cook! I lived in Europe for nearly a decade but there are still some of your northern African recipes that have some confusing ingredients but I’m still trying new things. Thank you for your emails, your recipes, your website and your videos. How can I get your cookbook? I don’t have a printed cookbook out…yet 🙂 If you’ve signed up for the e-mails, you should have received a copy of my free e-cookbook. If not, please reach out via email and I’ll be happy to e-mail it again. Thank you so much! I have to admit to tweaking this a bit with less pasta and beans and more veg. As we don’t have fire roasted canned tomatoes here in Oz I added a teaspoon of liquid smoke. Thanks Suzy, it was delicious. I also added a little chopped Dulse seaweed. I was lazy and cooked the pasta (Einkorn) in the soup. That’s wonderful, Irene! I love that you tweaked the recipe to your taste and what’s available to you. Glad you enjoyed it. Hope you enjoyed it, Deborah! Thanks for stopping in! Any substitute for the canned fire roasted tomatoes? Not available here in Thailand. Hi Fred. They’re not essential, if you can find quality canned tomatoes, that should still work! My brother in law always makes the pasta fagioli and I now have a go to recipe to try when I make it here at home. This is a great way to warm up on a chilly day. Can’t wait to try your version. YUM! I’m loving this pasta dish with all the veggies and flavors!